Twelve girls. Four weeks. One reality TV show. The prize? A rock star's heart. After losing her job as an apprentice chef, Penelope will stop at nothing to regain her reputation. A reality show where she can demonstrate her skills on national television is the perfect opportunity. 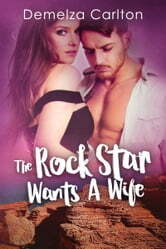 She's not looking for love, but four weeks in paradise being romanced by a rock star might be enough to change her mind. And when that rock star wants a wife…will marriage be on the menu?